ANCA summer interns with Program Director Tereza Yerimyan heading out to a Capitol Hill hearing. ANCA Chairman Emeritus Garo Armenian during his annual dialogue with ANCA interns regarding the Armenia’s geopolitical challenges. Archbishop Hovnan Derderian, Primate of the Western Diocese of the Armenian Apostolic Church of North America, with Rep. Adam Schiff (D-CA), ANCA Government Affairs Director Raffi Karakashian, and the ANCA summer interns following his opening prayer at the House of Representatives. House Foreign Affairs Committee Chairman Ed Royce (R-CA) with ANCA Program Director Tereza Yerimyan; intern, Sevana Dombalagian; Ms. Mary Ellen Iskenderian, President and CEO of Women’s World Banking; MMIT's Dr. Tavneet Suri and the Hon. Melanne Verveer following a hearing on women’s empowerment in developing countries. Congressional Armenian Caucus Co-Chair Frank Pallone (D-NJ) discusses Artsakh safety, security, and rehabilitation with ANCA interns. ANCA intern Harout Manougian asks questions at a US Institute of Peace briefing on ISIS. ANCA and Armenian Assembly of America (AAA) interns had an exclusive curated view of the World Bank’s Armenian art collection, on loan through the generosity of Mrs. Rita Balian. Rep. Zoe Lofgren (D-CA) with constituent Marie Papazian. Armenian Legal Center Executive Director Kate Nahapetian discusses summer project specifics with intern Garen Kosoyan. Mass. Congressman Joseph Kennedy, III (D) discusses the Artsakh “Thunderclap” advocacy initiative with constituent Taleen Simonian and Mari Tikoyan. 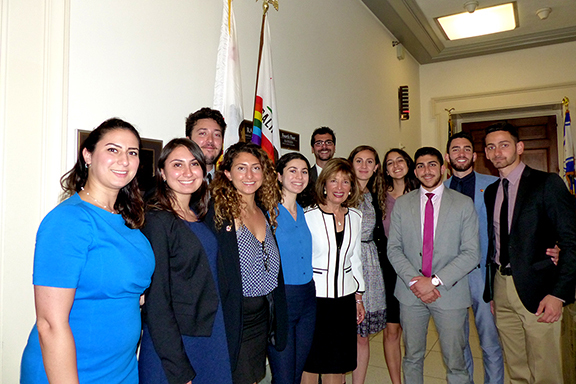 Congressional Armenian Caucus Co-Chair Jackie Speier (D-CA), who is of Armenian descent, shares reasons why she has pursued a career in public service and encourages the ANCA summer interns to consider career opportunities in DC. ANCA interns holding signs they designed at the July 19th “A Stand for Free Speech” held at Washington, DC’s Sheridan Circle, site of the May 16th attack by the Turkish presidential security detail which hospitalized nine people. Rep. Katherine Clark (D-MA) with constituent Harout Manougian following a meeting regarding US-Armenia relations, Artsakh security and broader community concerns. Republic of Artsakh Representative to the U.S. Robert Avetisyan sharing the latest news from Stepanakert with ANCA summer interns. Dr. Levon Avdoyan, Armenian and Georgian Area Specialist under the Near East Section of the African and Middle Eastern Division of the Library of Congress, offers insights on the over 40,000 Armenian related holdings of the Library. The ANCA summer interns with the wonderful ANC Richmond team at their annual picnic. ANCA summer interns gather on a weekend to reach out to Armenian Americans across the U.S. to contact their legislators in support of the Trott Amendment to block the sale of handguns to Turkish President Erdogan’s security detail. The ANCA summer interns celebrating July 4th on the steps of the U.S. Capitol. ANCA Chairman Raffi Hamparian and ANCA Eastern Region and Western Region Chairs Steve Mesrobian and Nora Hovsepian, respectively, share organizational policy priorities with the ANCA intern team. The ANCA summer interns had a wonderful time cheering on the TUMO Center’s Robotics team as they won the bronze medal at the First Global competition. The ANCA and Armenian Assembly of America summer interns at our annual mixer, hosted this year at the ANCA. Armenia's Ambassador to the U.S. Grigor Hovhannissian discusses Armenian foreign policy challenges and opportunities with the ANCA summer interns.